What and where did you study? Describe your university experience. I studied BA Photography at Plymouth College of Art. My three year experience of the colleges BA course was strongly beneficial for me and helped me find a confidence within myself and my work. The college possesses a welcoming and supportive environment which was exactly what I was looking for and needed as an artist in order to maintain focus and feel like I could succeed to the best of my ability. My tutors and lecturers were continuously available to help me with developing ideas and exploring various processes. As a student I wanted to explore as much as I possibly could with what was on offer at the college. As the college is purely focused on creative practices and disciplines, I was able to not only explore various realms of photography but also other mediums, allowing me to connect with other students and develop collaborative opportunities. All of these key aspects of what the college offered to me as a student helped me build my confidence within a professional environment and also allowed me to flourish without feeling like I was unsupported. How would you describe the work you make? What are the typical themes and ideas you like to explore? The themes of memory, trauma and family relationships are always somewhat present within my personal work. It was only recently that I took time to look back on what that I had been making since being at school and reflect on realisations about my work. Distinguishing how everything has always responded back to an emotion or an experience of which has taken place in my past how allowed me to fully realise that making my art is a mechanism of having control other my trauma. The process of making work has become a therapy for me, giving me back the control within experiences I did not have control before. Tell us about your shortlisted series. Silence aims to extricate a sense of belonging within a dysfunctional family. The work expresses an essence of feeling invisible to those who are closest to us. To those who are as yet unaware. After developing a strong connection with my heritage through archiving historic photographs and other family relics, I continued to explore the vernacular, allowing me to form relationships in a space in which I feel visible. The process of scanning, re-printing and re-aging each photograph allowed me to take back a sense of control and feel present within a family space. What are you trying to get across to your viewer with this work? Having this series present within exhibitions and hearing the reactions from the audience has helped me to distinguish similarities within every family space. The project began as an experiment. It was not until I had constructed the series of prints that I felt an essence of emotion with them. There was never an underlying intention of making these constructed images for a defined meaning. Once seen by my family at our graduate shows, that is when the work began to trigger and start conversations. I think the work is relatable in an international form and the viewer is able to connect and interpret the work as they will. How personal is this work to you? What have you discovered about yourself from making it? All of my personal project has a personal connection to me and my experiences with emotional trauma. Making art allows me to continue processing and dealing with emotions and feelings archived in my mind. Silence was the beginning of developing my confidence and self-esteem. It was the beginning of addressing topics that I had kept to myself for a long time in connection with my family and the way I felt within a dysfunctional family space. A sense of confidence was definitely unearthed through the process of making and also a sense of being unapologetic for my feelings. What’s important about the smaller, overlaying photographs in Silence? Each of the smaller images in Silence are snapshots my Grandfather took on his travels whilst being in the Royal Air Force. I was not aware of these photographs until I sat down with my Grandmother and went through her personal archive of photographs. I wanted to use these snapshots in particular as a way of symbolising that my Grandfather’s images allowed me to feel connected during a time in which I didn’t not necessarily feel connected to members of my family that were present. The placement of the images was done in response to my own feelings of invisibility. One is most commonly identified by their face and therefore when the face is covered or hidden, there is a sense that the identity is lost. Who visually influences your work? Throughout my research studies there has always been practitioners I return back to. These include the likes of Lucas Simoes whose work continues to make me think and discuss the photograph as an object that beholds much more than what is just visible to the eye. I discovered Simoes work whilst studying art at school and ever since then I have continued to look at back at his work and also been witness to how his work has developed since I first came across his work. 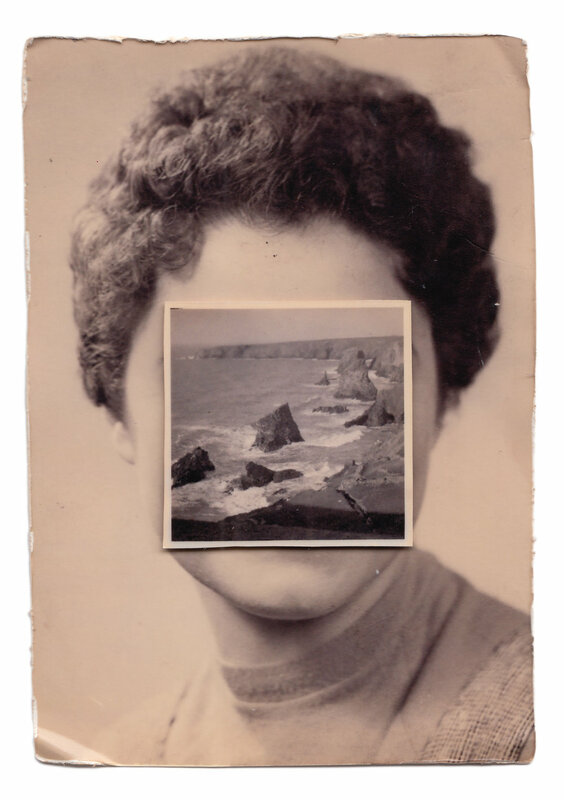 Other practitioners that have influenced my own practice include John Stezaker, whose process of placing secondary layers on top of pop culture media led me to experiment with placement of imagery. In this age of social media it is very easy to come across and discover artists of which you have similar themes of work or connections with. How do you think being shortlisted for this year’s South West Graduate Photography Prize will benefit your career? Did the exhibition go well? Being shortlisted for any competition or show is very beneficial for ones career as it opens up opportunities to be discovered by other practitioners or people that are interested in getting to know you and your practice more. The exhibition took place during this year’s PHOTOBLOCK festival. Having work up on a wall in the middle of London is such a great opportunity to have discussions with people and talk about work. As a practitioner it is always important to talk about our work as I believe feedback is a key area for further development with new projects. Talking to people who came to see the show and listening to the reactions they had in response to my work was nothing but positive and I made a lot of connections during the week we were there. The other artists involved with the show were a pleasure to work with and we worked together collaboratively to set up the show. The experience was great. I returned to London in November last year with a singular image from my Silence series exhibited during the 21st National Open Art Competition.